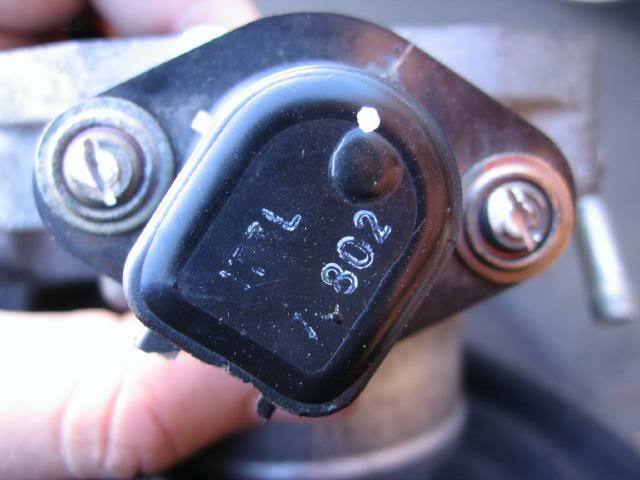 The Honda TPS sensor (throttle position sensor) monitors the throttle position and sends that signal to the ECU. The computer uses the TPS signal along with many other sensor inputs such as: MAP, Air Temp, Barometric Pressure, and RPM to maintain proper engine response and idle performance. Basically it is how your ECU knows your throttle input. 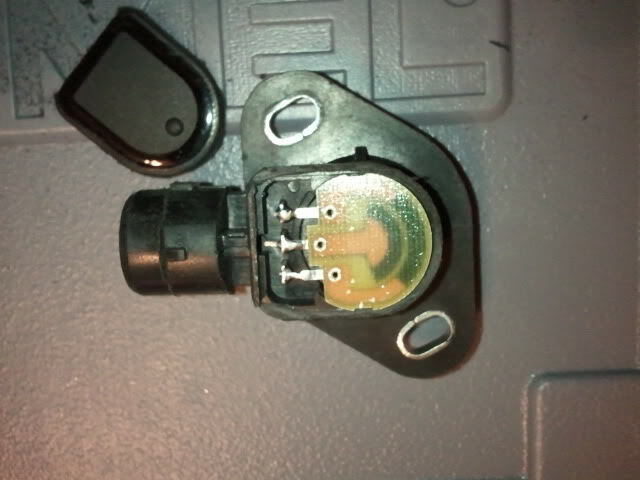 Electrically, Honda TPS sensors are basic variable resistors. They have a given resistance at rest and as the throttle is opened, the resistance is lowered and more voltage is sent to the ECU. This should result in a smooth increase in voltage on the output wire as the throttle is opened. The operating voltage is from 0.5v DC at rest (closed) to 4.5v DC at wide open. Symptoms of bad TPS include hesitation/stumbling/misfiring at low RPM and poor fuel economy. It can also cause problems only at a specific throttle position. For example stumbling/hesitation only at 25% throttle but otherwise ok. The Honda TPS has 3 wires and you can easily check with a regular DC voltage meter or multimeter. 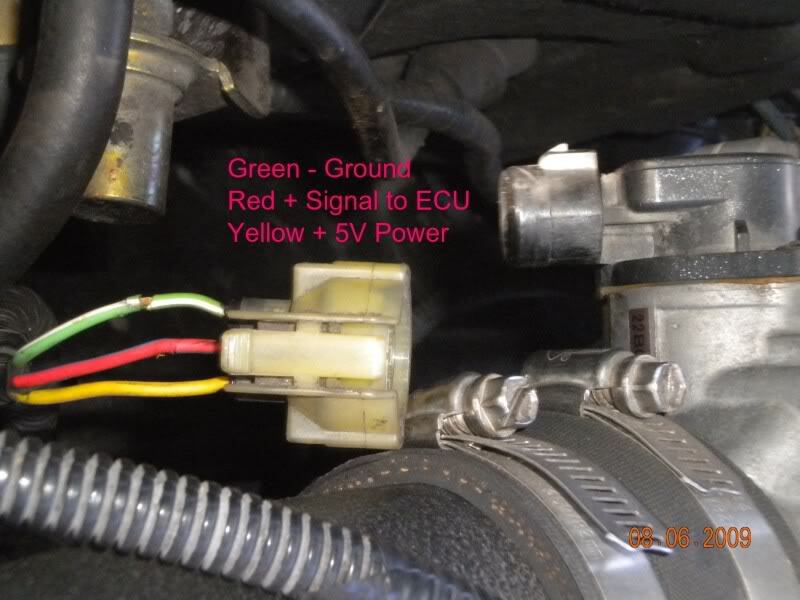 The YELLOW wire is 5v DC + positive and should always read 5V when the key is in the ignition. 1. Set meter to continuity ( -->I-- ). Some meters have (((( symbol which will beep when there is continuity. 2. Connect negative lead of meter to battery ground. 3. Connect positive lead to green wire. Verify that the wire has a good ground. 1. Set meter to DC Voltage. 3. Connect positive lead to red wire. You should see approx 0.5v when closed and 4.5v when you fully open the throttle body. 4. Check the TPS voltage for “Dead Spots”. Throughout the range of movement the voltage should increase smoothly and steadily without any sudden voltage gaps, drops, or spikes . (to reset ecu, disconnect neg battery cable. Remove "Hazard" 10A fuse from under hood fuse box. Count to 20. Insert fuse and reconnect battery. 1. You can Remove throttle body - Disconnect intake, throttle cable, wiring plugs, and vacuum lines. Remove (2) 12mm bolts and (2) 12mm nuts. Just remember a new TB gasket. 2. To Remove TPS - some have (2) Torx screws holding on the TPS. For earlier years there are machine screws that you'll have to cut a slot in the screw head and remove with a flathead screwdriver. A dremel with a cut off wheel of a hacksaw blade work well to cut the slots. 1. 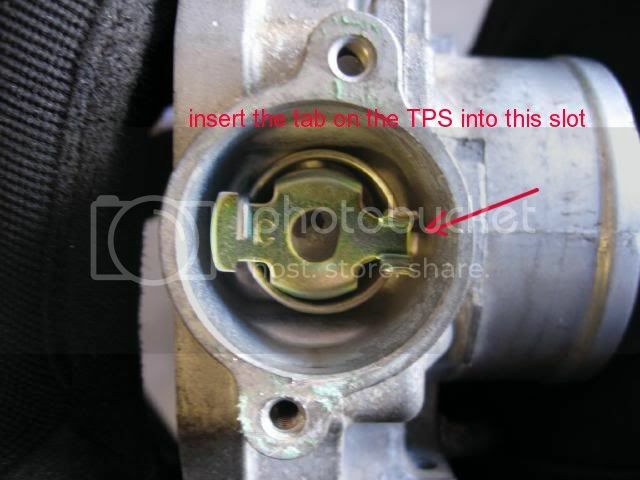 Replace TPS - insert tab on TPS into slot on the TB and turn counter-clockwise until the bolt holes line up. Tighten the screws finger tight but loose enough where you can swivel it. 2. Reinstall throttle body and connect TPS wiring plug. 3. Connect negative meter lead to battery ground. 4. Connect positive meter lead to red signal wire and check voltage. 5. Turn TPS until you get a reading of 0.5v DC and tighten screws. 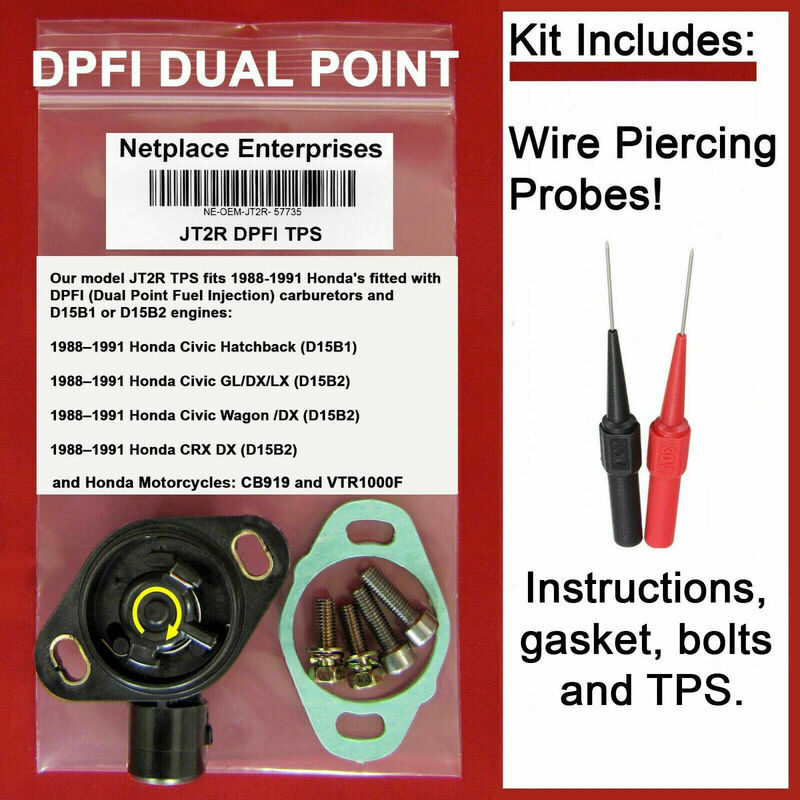 The TPS Sensor on the DPFI version is different than all the other types of MPFI Throttle Position Sensors. The DPFI version rotates in the opposite direction as all the MPFI versions. Because it rotates in a opposite direction, the wiring is reversed to account for this change. *If you are swapping to a MPFI setup or B-Series, you must reverse the position of the yellow and green wires. For a replacement sensor you must get a TPS for the DPFI setup because the others will not work directly. Others have disassembled the sensors and talked about some possible repairs on these threads, but nothing too substantial. Last edited by gringo7718; 10-10-2012 at 07:30 PM. I will say this should be a sticky. Very useful and a topic that can be confusing for some people. Also, the tps calibration should really be done with the car warmed up. It probably won't make too much of a difference, but that is what all my dealership grease-monkey friends have told me. Awesome info, this is very helpful! There is a lot of conflicting information about how to calibrate a tps but this definitely clears it up. This should be added to the FAQ section for sure. hi, i hate to spoil the thread, but i really need help in something and i have a feeling i am in the right place. I own a 1991 civic with a d15b2 mpfi swap which i did 3 years ago myself. I had to replace the tps sensor (at the time of the swap) because it was broken, so i adjusted it to 0.5v at closed tb and aprox 4.5v at wot ,i run perfectly. Thing is i recently started getting code 7 very often , some times even 5 times in a route from home to work, so i though i should re-adjust it. To my surprise i got 0.5volts at closed tb and 4.2volts at wide open tb,if i adjusted it based on 4.5vot it would be off at closed tb, i know its not the tps because i have tested 3 of them, so what i did was that i removed the tps plug and put the negative of the voltmeter to the left contact of the plug and the possitive to the middle one (with the key to position 2) and i got 4.85 volts instead of 5volts. so the question is ..where did these vital 0.15 volts go and how can i solve this? where does the 5volt signal come from and whats its route? is there a way to test the source of the signal , see if there is something wrong with the wiring? i am really stuck and i need help! Have you checked the yellow wire to see if you have all 5 Volts? yea, it shows 4.85vots instead of 5volts..so the hard thing to find is where did the missing 0.15volts go? With the car off the voltage may be low, that is perfectly normal. Start the car and I bet it's 5.0 or higher. Your battery or grounds may be the problem as well. alright i just came back from the car..and i did the following..i removed the third plug from the ecu(with the car not working) i measured the side cables of the tps plug at the 200ohm scale, and it came up with 2.7ohms..any ideas? i am going to go ahead and get a new tps, but those ebay ones look really fake quality, is there anyone selling original tps?or a good brand? I would have to see a schematic to see where loss-points could be. Are you sure your multimeter is accurate? Some of the cheapo multimeters are suspect. Also, this might be a pretty stupid question, but if you wanted to run a leaner A/F mixture, could that be accomplished cheaply by adjusting the TPS *very slightly* so instead of say 1.1 volts at 25% throttle, it says only 1 volt? yes i found the loss point, it was a pointy part of the soldering that with the engine heat and the 3 year time (which was when i did the wiring for the mpfi swap) it had gone through the tape and to the other wires, so i fixed that. i get 4.97volts which is good enough. but now after de-assemblying an old tps i noticed that it had a bent brush inside, and maybe that bent brush is the same problem with my current tps. Bottomline is that i am looking for a new tps, there are tps sensors on ebay that start from 5$ shiped to 50$ shipped..point is which should i trust?any good brands?a link to the right direction would help , i just need to solve this problem forever and forget about the word "tps"
"Or you could buy a new one from omni power "
same TPS that everyone else was selling, the one that mounts and turns in the wrong direction! I bought 2 off ebay and and again received the same wrong parts. Apparently, everyone on ebay is using the same faulty database. There is no way the Honda TPS (DPFI one) fits like 30 other Honda's, some well past the year 2000! So frustrating! I finely got one from a junk yard, but now it is has started to fail as well! Also tried fixing one of the old ones, but they used different size brushes then the newer ones. Any info on removing the wires from the pins on the connector? Since that time I went into the TPS business and now sell them myself! Last edited by netplaceus; 12-20-2012 at 11:07 AM. I have a 91 accord wagon, trying to calibrate the tps. I've looked at the transmission wire and adjusted it a bit with no change in wot voltage. I've tried two different tps and both give the same voltages. I didn't have the sensor seated properly, hence the lower voltages. I had a cheap meter, so readings fluctuated too much. New meter and a properly seated sensor = success! I've seen some say to set the idle voltage at .48, and others at .5v? What is the effect of setting it at .48? Does that alter A/F ratios and lean it out just a little? I believe I originally saw this on Team-Integra.net. Yay for plagiarism! What a nice post that you have shared. Last edited by Jazz555; 12-02-2014 at 10:45 PM.